Long service award recipients and dignitaries outside the newly commissioned logistics centre. 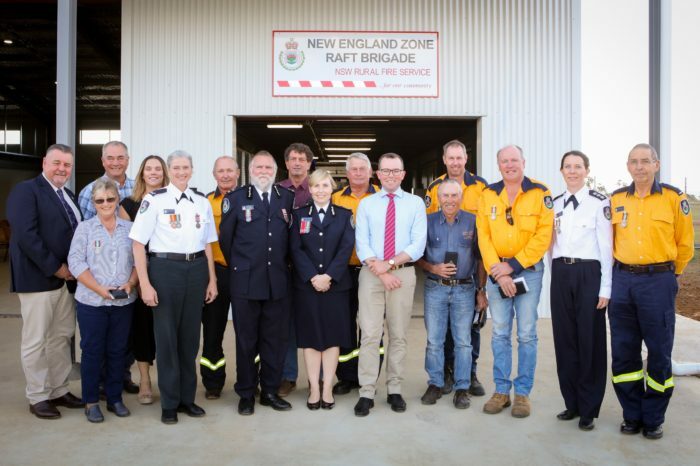 THE NSW Rural Fire Service (NSW RFS) New England Zone celebrated the achievements of veteran volunteers on the weekend, while welcoming the investment of almost $750,000 in the New England area with the handover of a new vehicle and the official opening of a new combined station. Member for Northern Tablelands Adam Marshall joined NSW RFS Assistant Commissioner Rebel Talbert, Armidale Regional Mayor Simon Murray and Uralla Shire Mayor Mick Pearce at the ceremony where they inspected the new facility for the New England Logistics and New England Remote Area Fire Team (RAFT) Brigades and thanked volunteers for their ongoing commitment to the New England Zone and the Service. Mr Marshall said the new $600,000 station would provide enhanced support to volunteers as well as the brigades and communities they protect. “This new station, co-located at Armidale Airport will further help members of the Logistics Brigade assist with vehicle movements, brigade station maintenance and the fighting of fires locally,” Mr Marshall said. “We continually see how hard our skilled firefighters and support crews work to keep us safe when bush fires and emergency situations threaten and I offer my sincere thanks and gratitude to all the NSW RFS members for their outstanding efforts. “NSW RFS is committed to providing volunteer firefighters with the equipment, infrastructure and resources they need to carry out the important work of protecting their local communities from fire and a diverse array of incidents. Mr Marshall also thanked Armidale Regional Council for funding part of the station and he acknowledged the continuing efforts of all local members who will benefit from the new facility. “Having the RAFT Brigade also co-located in this new station so close to the airport will be most beneficial, especially with the highly trained members being available for Rapid Aerial Response Team stand-up,” he said. Along with the New England Logistics Brigade receiving a new Category 17 general cargo truck worth $149,000, Mr Marshall also presented 12 Long Service Medals and two National Medals to members from the New England Zone in recognition of their ongoing commitment to their local communities. “These medal recipients have accumulated a total of 271 years of service between them, which is extraordinary,” Mr Marshall said. “Special mention to James Stewart of the Baldersleigh Brigade who has given 37 years’ service to the RFS. James has held many positions including President and Permit Officer.